It was a beautiful, sunny day in Key West, Florida. The temperature was perfect. The palm trees and pristine white architecture beckoned and smiled upon us. 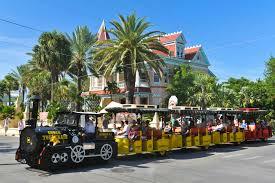 We were seated on the Conch Train surrounded by merry and boisterous tourists. We were on our way back to our cruise after a half-day excursion in Key West. It was obvious that many of the passengers had partaken in local spirits from their loud and rambunctious behavior. I was snuggled next to my youngest daughter on a bench behind my husband and our two older children. My older daughter and husband were busy snapping pictures and I was chilling. I had placed myself in that mental zone where my mind was mostly off and my senses heightened. I let the rumble and bump of the train, the soothing tropical breeze, the exclamations and laughter of the strangers around me, and the passing scenery fill the space in my brain that was normally cluttered with planning, questions, observations, worries, ideas and philosophies. I absently glanced at the carefully tied plastic bag at my feet that contained the portion of my unfinished lunch. It was at an angle. Not a good position for spiced shrimp cocktail. I leaned over to survey the damage and in the process juggled my purse, which promptly plopped right out of my lap and into the street. And the train was moving. It was moving slowly, but nonetheless moving. I exclaimed to my husband that my purse had fallen off of the train. Before he could answer, and seeing the blank look on his face, I shoved my drink into his hands and jumped off the moving vehicle. Without thought. I rarely do things without thought. In fact, I usually tend to apply too much thought before I do anything. This was instinct. I could not lose my purse that contained everything. This was no little bag. It was a heavy, fully loaded collection of very necessary things as well as a plethora of unnecessary items. As my flip-flop laden foot hit the pavement, I remember being unsure for a few seconds if I would be able to keep my balance under the strain, but I used the momentum to hurl myself into a run. I ran in the opposite direction, in traffic, and did not look back. I didn’t hear the uproar on the train as the others thought I had fallen out. I was focused and I ran after my purse. It flitted across my mind that I didn’t know how I would get back to the imminently departing boat, but I dismissed the thought figuring that I would have to address that issue later. As I sprinted down the road I saw a passing motorist scoop up my purse into his car. Moments later, I caught up to him and he handed it to me without a word. I thanked him breathlessly and turned around to speed back in the other direction. Would I be able to catch my train? I would surely try. I did have to slow my pace for a couple of moments to manage my scattered and jagged breathing. I was definitely winded. I could still see my train in the distance, and after a brief reprieve, I doggedly continued chasing my ride in my sundress and flip-flops. I did catch that train and had only one near miss with a car that wasn’t expecting a crazy pedestrian attempting to jump on a train in the middle of the street. After I heaved myself back on the train, I held my purse aloft and received cheers and applause from my fellow passengers. The man next to me said he almost jumped out after me and his friend said he videotaped the whole thing to add to his other views of the Key West scenery. I just hugged my purse to my chest and felt happy and satisfied that I had it back and that I had summoned enough guts and stupidity to rescue it.